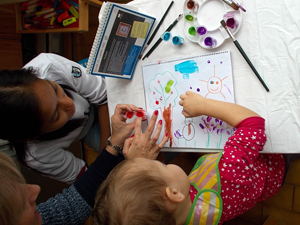 The Toddlers Box is designed to introduce your child age 1½ – 3 to structured activities and prepare them for kindergarten with art, games, songs and rhymes. Between the ages 1½ – 3 your child is developing in leaps and bounds as they learn about the world around them through their senses. As a parent, by providing them a stimulus-rich environment at home you encourage them to develop both their mind and their body, helping to ensure a balanced and well rounded child. Your child will enhance their perceptual development through hands-on activities done in a familiar and safe environment – with you (or a helper) in your home. How do our Toddlers Boxes help you? Our Boxes help busy parents like you spend more quality time with your child, strengthening your parental bond doing fun activities together. Have any questions about the Toddlers Box? Just give Julie a call at +852.2818.2278 and she can help you. Click here to download 4 Toddler Activities for Free!